I've always considered the phrase "beach-chair literature" to be a misnomer, not only because it insinuates that a book has no value whatsoever, except to kill a few insipid hours on a beach or in a garden during a warm summer day, but also because it has been used way too much as a curse word to denote genre fiction – i.e. the literary equivalent of schoolyard name calling (Eew! detective, science-fiction and romance novels have icky cooties!). However, I have to admit that the mystery genre, as a whole, does resemble a holiday resort, of sorts, where you can participate in the Grandest Game in the World. It's an attraction more alluring than the Lorelei and drew such visitors as the children's book author A.A. Milne, the humorist Damon Runyon and the Pulitzer Prize winning novelist MacKinlay Kantor to its shores and that last name happens to be subject of today's talk. MacKinlay Kantor was a prolific novelist, screenwriter and journalist whose 1955 historical novel, Andersonville, set at a Confederate prison camp, landed him the prestigious Pulitzer Prize the following year, but his prose also smattered the pages of pulp magazines (Detective Fiction Weekly, Dime Detective, etc.) 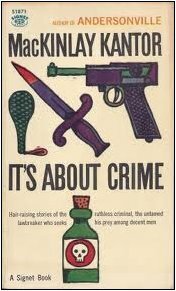 and "slicks" like Collier's – and two fist full of criminally inclined stories, originally published during the late 1920s and 30s, were collected thirty years later in a volume garnished with the punning title It's About Crime (1960). A book title Craig Rice would've approved. It should be noted, however, that this collection of short stories wasn't my first run-in with Kantor. The anthology Tantalizing Locked Room Mysteries (1982), edited by SF-legend Isaac Asimov, collected one of his stories, "The Light at Three 'O Clock," which turned out to be one of only two stories in that collection really worth reading. Robert Adey described it as “pure John Dickson Carr” and not entirely without reason! The opening of the story, concerning the spook phone calls from a locked apartment received by a switchboard operator, does suggest Carrian influences, but the solution belonged on the pages of a detective story from a previous era. Still, it was a marvelous read and when I read that a few of his stories were collected, including several focusing on impossible crimes, I simply had to have it sooner or later – and the latter happened to be last week. Before I take the stories down from the top, I have to point out something that I noticed while reading these morsels of crime: Kantor was a mystery writer who was closer to the hardboiled school than to the ratiocinative detective stories and they're not always paradigms of fair-play, either. On the other hand, the quality of the writing is excellent and the text scattered with fascinating ideas or imaginative scenes. A short-short story, in which a bum, who's also a gifted sand sculptor, has a run-in with a gang while working on a depiction of the crucifixion. The gang quickly takes care of the poor man, but they forget that silent witnesses often have more to tell to the police than any stool pigeon, which, in this case, happened to be the sand sculpture itself. A very competent crime story with an original dying message. A Christmas tale that almost put Santa Claus behind bars. Well, not exactly like that, but the janitor of the Farmers National Bank, who plays Santa each year, was looking at the possibility of a long term prison sentence (or worse) when someone murdered his boss, Lewis Hermans, and the only person who could've done it and carried off the murder weapon was him! Not exactly fair play, but the solution really makes this a holiday themed mystery. One of those "A-Hoist-On-Their-Own-Petard" stories, in which a poor landscaper shoots one of the burglars who looted his employers safe and keeps the stolen goods for himself. It's a fun and amusing read, but you can see the twist coming from a mile away when he buries part of the stolen goods, marking the spot with the stand of the shadow from the flagpole at a specific time and date, and then runs for foreign soil – before he returns a decade later. Robert Arthur wrote a similar, but much better, story, entitled "Mr. Manning's Money Tree," collected in Mystery and More Mystery (1966). A rookie policeman wants to prove himself to his elder brother, who's a decorated policeman himself, and does so in a shoot-out with a bunch of gangsters. It's not a bad story, but nor is it particular good or memorable. One of the two stand-out stories of this collection, in which a small-town doctor, comfortably leaning against his pension, tells his successor of his father and brother – both of whom disappeared over 60 years ago. It's one of those unsolved mysteries from which rumors and ghost stories can be tapped for generations on end, but recent events in town eventually dredged up the truth and this provided a memorable scene as well as a satisfying conclusion. Maxwell Grame is a poor-man's Sherlock Holmes, specialized in tracing lost pets and determining the authorship of anonymous letters, but then he's finally presented with a case worth his mettle: a baby grand piano is whisked away under impossible circumstances from a second floor apartment. I immediately figured out the method, but that did nothing to diminish the fun and the ending was simply perfect! A very, very weak entry in this collection, in which the owner of a lunch shop and sole witness of a bloody bank robbery helps the police in identifying one of them based on how this person behaved when he was in his shop prior to the robbery – which I didn't buy for a moment. Nobody behaves like that, especially if you're planning to rob the bank opposite of the shop and trying to keep a low profile. The salmon part, OK, but the numbers part? Get out of here! The proceeds of a charity event, a small-town fair, are, once again, violently taken by a bunch of desperados and they are taken care of by the man who ran a gaming stand – drawing on his past as a conman and carny to take care of these gangsters. Not bad for a crime story. A good story that begins as a nicely done, atmospheric ghost story when a switchboard operator begins to receive midnight calls from an empty and locked apartment from which the tenant disappeared the day before – presumed dead. The only weak spot is a routine solution you expect from a detective story written before the 1920s, but if you can banish the locked room ploy from your mind, it's an excellent read from start to finish. A string of threatening letters, signed by "Wolf," announcing the impending death of a prominent citizen, sows confusion with the local police – until they receive an unsigned letter and the person mentioned in it is shot to death in his library. The murderer appeares to have been standing on the balcony, but the rust and soot of years argued against this theory and left the police with a bone-fide locked room mystery. Again, it lacks fair play clueing, but it has Kantor's cleverest solution for an impossible situation. So a victory for Kantor on technical points? A short-short story, in which the passing of time wreaks havoc on an ex-convict plans of revenge. Meh. I would've ended this collection with one of the two previous stories. All in all, not a bad collection of stories from someone who was not seen as a mystery writer, but than again, that may also be biggest weakness for some of these stories – as they clearly lacked the experienced hand of a Carr or Queen. But, as I noted above, the excellent and often imaginative writing compensates a lot of their shortcomings. Nate Berkus would love this new blog look. (There's a Google research project for you. Bet you haven't a clue what I mean.) Why the name change? Strange metaphor. I'm sure it's a quote or an allusion but I'm unfamiliar with the phrase. I explained the name change on the GAD group, but I think it’s a perfect. 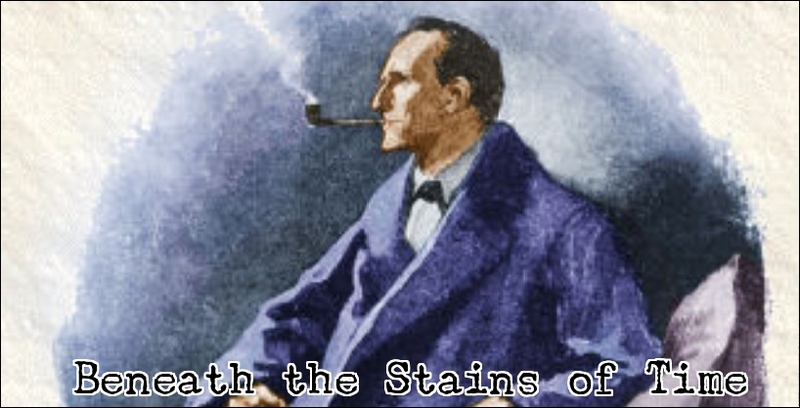 This blog looks beneath the stains of time for forgotten and unjustly neglected mystery writers and detective stories.